Saku Läte offers 2 quality coffee beans series. 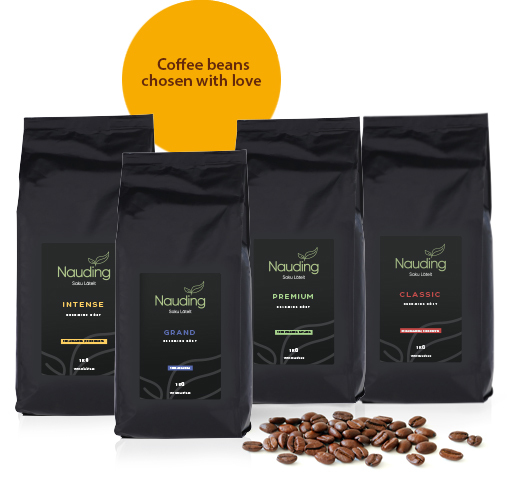 The main series include Intense, Classic, Grand and Premium beans. Exclusive Perfect Dark and Perfect Crema coffee beans are from Colombia, ANEI farmers. Which type of Saku Läte bean shall I choose? Intense– A blend of 70% of arabica and 30% of robusta beans of different varieties from South America and Asia. Pronounced taste due to the 30% robusta content. Slightly chocolate flavor perfect for milk-based drinks and also drinking black should you prefer. Classic– 95% blend of Brazilian, Guatemalan and Honduran beans and 5% of Indian robusta beans. With a stronger taste due to the use of robusta beans, this blend is perfect for milk-based drinks and also for drinking black. Grand– 100% arabica blend of beans from Brazil, Guatemala and Columbia. Smooth and light taste with a hint of acidity. Especially good when enjoyed black. Premium– 100% Columbia Supremo arabica beans that have been hand-picked and hand-sorted. Delicate coffee with a slight fruity flavor. Its superior quality can be appreciated to the fullest if you drink it black. Perfect– Slightly fruity and winey flavor with a hint of chocolate and nuts. 100% arabica. From ANEI farmers, Colombia.